'Grande Valse Brillante', Op. 34, Nr. 2, by the Polish composer Frédéric Chopin (1810-1849), transcribed by Isabelle Moretti for harp. Recital at the Gargilesse Harp Festival, 2010, in the Indre department in central France. ISABELLE MORETTI: "MY FIRST HARP TEACHER CALLED ME A DIAMOND MINE"
"The harp is a magical instrument, but it is the music that makes everything beautiful." One of the main elements that seem to be a fixture in her playing is patience, but attentive listeners cannot fail to notice its refinement, a certain sense of stillness, plus naturalness and grace. 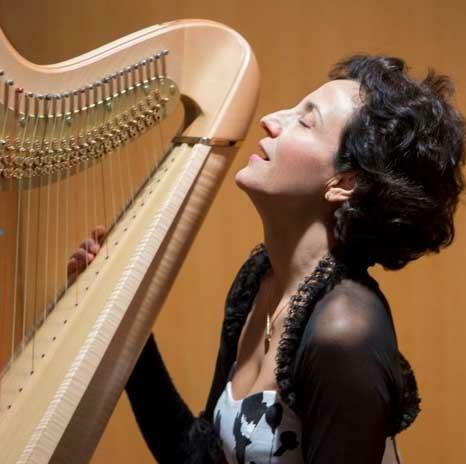 Isabelle Moretti (49) is the youngest-ever full Professor of Harp. She lives in both Nantes and Paris and teaches in Paris at the Conservatoire National Supérieur de Musique et de Danse. She is married to the famous harp-maker Jakez François, the august presence behind Camac Harps. Moretti will be coming back to the Netherlands at the end of February, where she will perform and be a judge at the Dutch Harp Festival in Utrecht. Moretti's captivating performances and refined style have moved audiences worldwide with works from the eighteenth century to the present day. 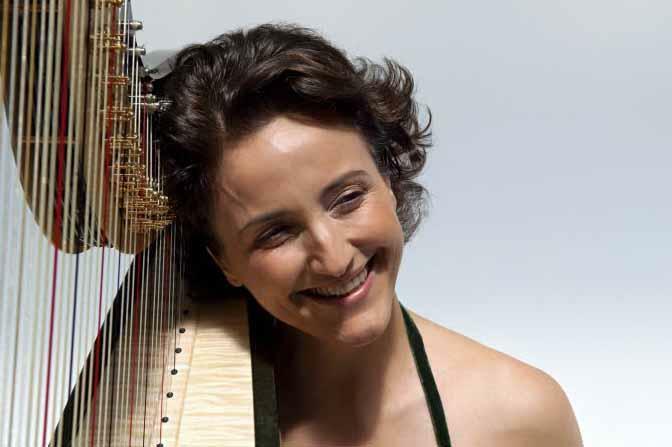 Isabelle Moretti is a phenomenon among the world's top harpists. No diva or 'diva fits' here - she is almost the same sweet schoolgirl she was at age seven, when she chose the harp for the reason that her fellow students all chose the piano. Moretti is highly intuitive, and follows her own feel and inner urge for originality. If everyone else chooses the piano, she will choose the harp. She is not concerned with what those around her think. But the nice thing is that Moretti, who still has distant but strong ties with Italy through her grandparents, has remained a 'normal' person despite her fame. "The harp is a magical instrument," she says lovingly, "an extension of myself, but the music is more important than the gorgeous instrument. The music that makes everything beautiful - that is what I want to give to people. I want to transmit my emotions. I am a colourist. I have a lot of imagination and put my own feelings and colours in my music. It is like telling a story. I actually feel like a story-teller. And of course, I want my story to be clear and to touch people. It is very important to be authentic in music, You have to learn to find the music inside yourself." "Germaine Lorenzini was my second mother." Isabelle Moretti, who calls herself a 'sensitive performer' rather than an 'intellectual harpist', is a musician through and through, down to her fingertips. She is one of the select few - no more perhaps than seven or eight - who make up the undisputed top players in the harp world. Yet Moretti remained down to earth. She owes both her musical insights and her simplicity to Germaine Lorenzini, whom she affectionately calls her second mother. Lorenzini was the harp teacher who supervised her musical and cultural upbringing for years. She was also the woman who gave her the warmth she needed to keep growing. "The music does not come out of the harp, but out of your soul." Over the years, Isabelle Moretti has come to understand the essence of artistry. "The music does not come out of the harp, but out of your soul," she says. Her love for the art of music-making but also for gastronomy, her second great passion, did not come out of thin air. With Italian blood running through her veins, she knows how to savour the worlds of both music and haute cuisine. It does not matter whether she is making food or music. Either way, it is about composing and 'the feel', the love with which the 'product' is made. Isabelle Moretti says: "The striving for perfection, the end result, the beauty - whether it is a well-composed, artistically presented dish, or a beautiful performed sonata, fascinates me endlessly." One of her great dreams is to take all of her harp students to Alain Passard's Stellar l'Arpège restaurant in Paris and show them some of his culinary feats, some of which she herself looks at with veneration. The way Moretti compares food to music-making testifies to her strong sensory perception. She calls Alain Passard and Pierre Gagnaire two shining examples of French great chefs. Isabelle adds: "I think they are really food composers. You can certainly compare music-making to food-making. In both cases, you have to attain a high degree of perfection; you can consider the melding of textures, flavours, and smells to be like writing a symphony. I have always loved food and have had a special interest in it since I was 20. The first time I ate at a 3-star Michelin restaurant, I cried. I was so touched by this food. Really superb food appeals to all the senses. I was amazed to feel this kind of perfection." Dishes composed by Alain Passard contain the mystery of poetry and traces of enigma. Always evocative of music, fugues, arias, sonatas, concertos, oratorios, they flow around a theme like a symphony. Chef Alain Passard sees himself as a 'flame sculptor' who knows how to marry fires and products: those which caress and those which capture the flavours… He likes to say that it is the colour of vegetables which attracts his eye. "Purple, yellow, celadon green, pearl white and orange inspire me. They are brought to life in touches. Then comes the technical skill." "Feeling is more important than technique." A born philosopher, Isabelle Moretti feels what is good, and what is art. "An instrument", she says, "is only a tool." She smiles kindly when talking about her love for art and that betrays her passion for her profession and her unusual way of 'adding warmth'. She wants to give her audiences beautiful sounds. "Feeling is more important than technique", she emphasises. "The exact position of my fingers and wrists on the instrument is less important. It is about the feeling I put into it and that has to radiate outwards to the audience. Technique mattters, but what is more important is the sound. I still do a lot of research into sound." With thanks to Germaine Lorenzini, a very special second mother. "In the beginning I just played the harp, because everybody said I was talented." 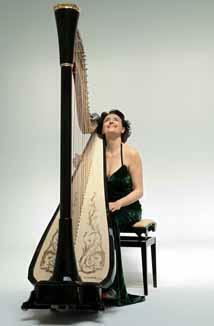 From age seven to fourteen, Isabelle Moretti had harp lesssons at primary and secondary school. She played with feeling but still without much passion. She may have been somewhat withdrawn, certainly not over-ambitious and in her early years she played the harp "just for fun". "I never thought I would become a musician or even a harpist. When I was young I had only one dream: I wanted to become a musical star on Broadway. However, when I saw the harp at the age of seven, I immediately fell in love with the instrument. It looked very beautiful and I loved the sound. I also loved it because it was a harmonic as well as melodic instrument." For the first seven years, Isabelle Moretti had a teacher who was not very inspiring and playing harp came second to going out with her friends which was more fun. When she was fourteen, she was at a competition and met Germaine Lorenzini, who was in the jury. Even back then, Lorenzini was an iconic harpist. She was an honorary harpist of the National Orchestra of Lyon and had studied with the famous Lily Laskine, followed by Jacqueline Borot at the Paris Conservatoire. The appearance of Germaine Lorenzini in her life had far-reaching musical and personal consequences. Isabelle Moretti reminisces, with an almost apologetic smile, that she had no idea at all what kind of musical talent she had. "I did not love the harp so much in the beginning. I just did it because everybody said I was talented. But I did not realise that at the time. I only practised two months for a competition, but then I went out with my friends to have fun. The moment I met Germaine everything changed. Germaine was a soloist in the Opera of Lyon. She comes from Marseilles and is a wonderful lady. She taught me many things, not only about music, but also literature and painting." "I thought her compliment was funny but still I wanted to discover my talent." Isabelle Moretti plays 'Une chatelaine en sa Tour' by Gabriel Fauré (1845-1924), one of the foremost French composers of his generation. Germaine Lorenzini immediately recognised that Isabelle Moretti was bursting with talent. Back home in Lyon, Isabelle secretly listened in on a telephone conversation between her mother and Germaine Lorenzini and heard her future mother-mentor speak the unforgettable words "Isabelle is like a diamond mine underneath a potato field." Still a bit naive at fourteen, Isabelle had to laugh at first. Now she says: "I thought it was very funny. It did not mean anything to me because I was not not conscious of my ability. I don't have a big ego. But of course I was curious and wanted to discover my talent." Germaine Lorenzini advised Isabelle to go to Paris with her parents to see Jacqueline Borot, harp professor at the conservatoire, for a second opinion. Lorenzini had never doubted that Isabelle had to become a professional harpist. The diamond had to be polished. And thus parents, daughter and harp teacher Germaine Lorenzini piled into a car and drove from Lyon to Paris where they sought and got advice from the renowned Jacqueline Borot (1916-1999). Once she was in the actual presence of the famous Jacqueline Borot at the Paris conservatoire, Isabelle was terribly nervous. "I was frightened to death because Jacqueline Borot had the reputation of being hard. But fortunately her assessment was positive: she recognised my talent and advised me to come and study in Paris." Isabelle would ultimately study with Borot from seventeen to nineteen. Isabelle Moretti is a laureate of international competitions in Geneva, Munich, and Israel, where she obtained the highest award in1988. She has been invited to play worldwide at the most prestigious venues and festivals, such as the Alice Tully Hall in New York, the Wigmore Hall in London, Soka International Festival in Japan, the Auditorium du Musée d'Orsay and the Evian International Music Festival, where she played a ragtime with Mstislav Rostropovitch, the Russian cellist, pianist and conductor. She is a soloist with the Bavarian Radio Symphony Orchestra, most recently under the baton of Sir Neville Marriner, the National Orchestra of Lyon, the Paris Orchestral Ensemble, the Bremen German Chamber Orchestra, the Israel Chamber Orchestra, the Orquestra de Córdoba, the Spanish Radio and Television Symphony Orchestra, the Israel Philharmonic Orchestra and she tours with the Zagreb Soloists. 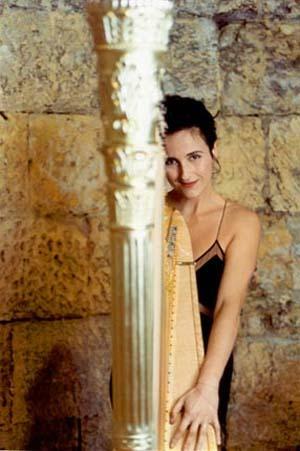 Isabelle Moretti is known as one of the most radiant and appealing figures in the world of harp. She is a free spirit who follows her own ideas and does what feels right to her. She plays her instrument with a unique, inimitable style, with sincerity and nobility. Isabelle Moretti's solo repertoire extends from the eightheenth century to the most complex contemporary music which she often features in her recitals. She performs a lot of music by renowned composers such as Claude Debussy, Maurice Ravel, Germaine Tailleferre, Jan Ladislav Dussek, Gabriel Fauré, Carl Philipp Emanuel Bach, the son of Johann Sebastian Bach, Paul Hindemith and Alphonse Hasselmans. In the realm of chamber music which she is particularly fond of, Isabelle very much enjoys playing with the well-known Magali Mosnier, who is the principal flutist of the Orchestre Philharmonique de Radio France under Myung Whun Chung, the famous South Korean pianist and conductor. Isabelle Moretti declares: "I don't like the flute very much but I love to play with Magali as she is an exceptional flutist and musician." Isabelle also performs frequently with Henri Demarquette, the notable cellist and with François Leleux, the famous oboist, conductor and professor who, at the age of 18, became the principal oboe at the Paris Opera. "I have to say that the duets I perform with Henri Demarquette, François Leleux and Magali Mosnier are quite important for me. They are amazing musicians, but more importantly, great human beings. They are my friends and that is even more important." Furthermore, Isabelle performs a lot with Dame Felicity Lott, one of Britain's most acclaimed and best-loved sopranos and a long time friend of Isabelle. Together they recorded a CD entitled 'Cantare', a celebration of a relationship between the harp and the voice ranging over a very diverse and surprising repertoire. 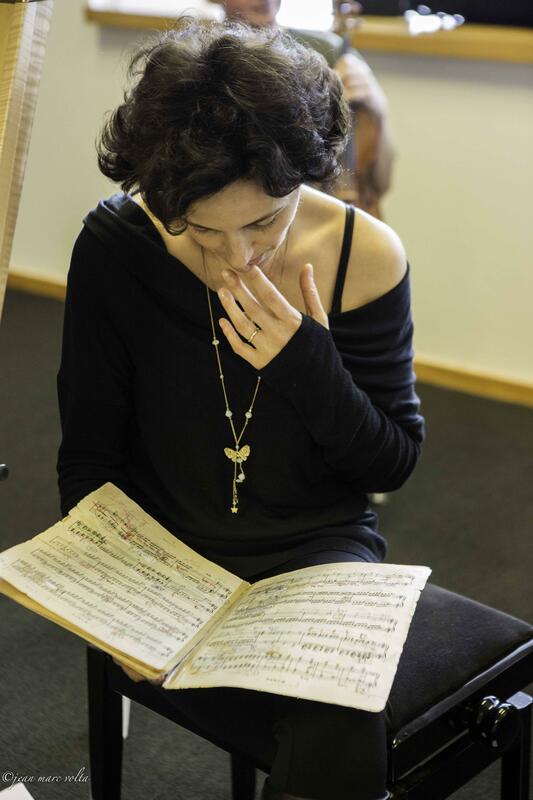 Isabelle Moretti also likes to perform work of famous composers. In 2006 she premiered the harp concerto of Philippe Hersant at the Théâtre des Champs-Élysées in Paris and Michèle Reverdy's concerto with the National Orchestra of Lille. She also released Philippe Hersant's CD with the label Triton in 2006 for which she recorded Choral for harp and cello with Henri Demarquette. "In 2015 or 2016 I am going to work on a concerto by Bruno Mantovani, the director of the Paris Conservatoire. It is a big honour and I am very excited of course." Moretti received many prestigious recording awards such as the Victoire de la Musique, Grand Prix de la Nouvelle Académie du Disque, Prix Charles Cros and Choc du Monde de la Musique and Dix de Répertoire. She gives master classes to students from all over the world at the Paris Conservatoire and the Royal Academy of Music in London where she has been a visiting professor of harp sind 2008. In 2007 Isabelle Moretti was appointed Chevalier de l’Ordre National du Mérite.